This context was adapted by information written by Milada Majerova for the ICRRR Part II Short Course. Silver Creek (aka. 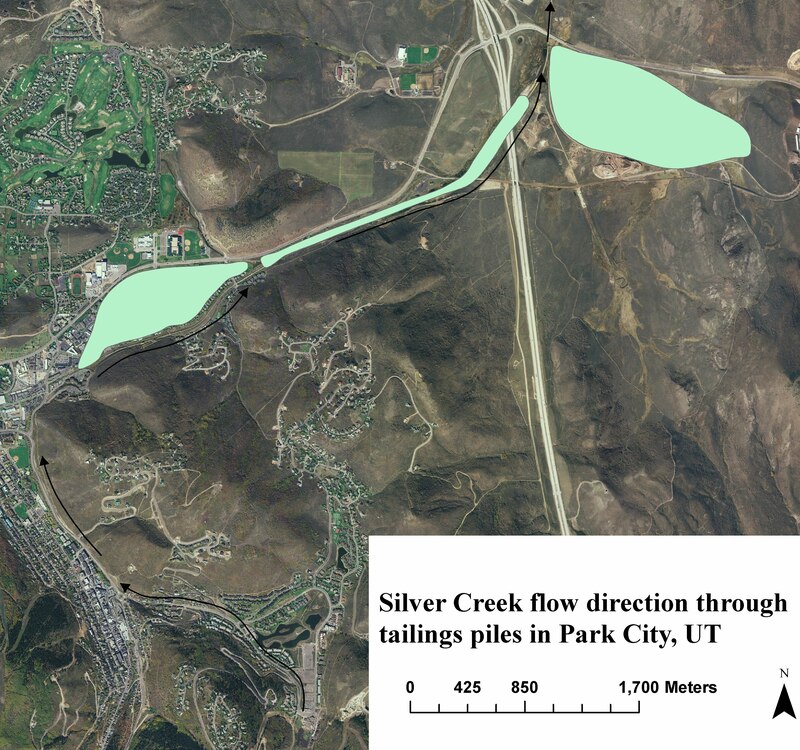 Poison Creek)’s headwaters are the mountainous terrain above Park City, Silver Creek is the principle drainage from Park City and has been altered via anthropogenic sources at several locations to accommodate city and railroad expansions. Silver Creek, originates as snowmelt runoff; however, much of the runoff in the upper drainage seeps into the subsurface prior to reaching the stream channel. Additional ground water is diverted into upper Silver Creek from the Judge mine-drain tunnel during part of the year, and flow increases downstream as a result of inputs from the Pace-Homer Ditch, a storage for ground-water discharge and surface runoff from surrounding land-use operations. Extending north from Park City through Snyderville Basin is a low topographic divide separating runoff from Park City into two watersheds. Streams on the west side of the divide drain into East Canyon Creek and then to the lower Weber River, near Morgan. On the east side of the divide, Silver Creek drains into the upper Weber River near Wanship. Figure 2 - Silver Creek Study Site Vicinity Map with aerial photo. Figure 3. Silver Creek Study Site Vicinity Map with USGS 7.5 Minute Quad. The Silver King mine, located near the headwaters of Silver Creek, was one of the largest and longest operating mines in the area. Throughout the mining era, ground-water flooding of the mines was a continuous problem, and it was not uncommon for ore veins to be abandoned because of flooding. To relieve some of the underground flow, tunnels were specifically dug to dewater the Ontario, Silver King, and Daly-Judge mines. The hundred-plus years of mining has affected the water in the Park City area in many ways. Wood was the primary building and fuel source, and the resulting deforestation caused sediment to easily move into the streams. Raw sewage from the growing mining town of Park City was disposed of in Silver Creek until passage of the Clean Water Act in 1972. Milling processes in the Park City area left waste-rock and tailings piles, which have eroded and leached metals into the streams. Tailings piles still exist in many areas of the Silver Creek drainage. A large pile adjacent to Silver Creek (Prospector Square) was capped as a mitigation measure to cease or slow the leaching of metals into the creek and to allow real estate development. However, uncapped tailings still exist along the south side of Silver Creek (the Silver Maple claims) where it parallels U.S. Highway 248. Figure 4. Upper Silver Creek showing flow direction and locations for potential interaction of active channel and tailings wastes. Currently, the system is under investigation by several federal and state agencies interested in high levels of metals distributed in streambed sediments as well as surface water. Silver Creek watershed is listed on the State of Utah’s 303(d) list as impaired for zinc and cadmium. Beneficial use 3A, protected for cold-water fish and other cold-water species, is identified as impaired. Historic mining activities in the vicinity of Park City, Utah, have greatly impacted Silver Creek, a tributary to the Weber River in northern Utah. Park City was founded as a mining town in the mid-1800s, when large deposits of lead and silver were discovered in the nearby mountains. For the next 100 years, silver, lead, and other minor minerals were mined and processed in the Park City area. By the late 1970s, mining activities began to decrease as the ski industry surpassed mining in economic importance. 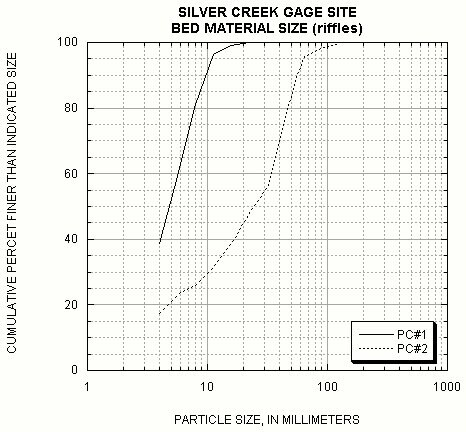 In particular concentrations of silver, cadmium, copper, lead, mercury, and zinc in the streambed sediment of Silver Creek exceed background concentrations. These metals also exceed established aquatic life criteria at most sites. In the Weber River, downstream of the confluence with Silver Creek, concentrations of cadmium, lead, zinc, and total mercury in streambed sediment also exceeded aquatic life guidelines. Although some remediation has occurred, residual deposits of tailing wastes remain in place along large sections of Silver Creek. The two main water quality concerns focus on zinc and cadmium. Average annual precipitation (1961-90) ranges from 19 to 44 inches, of which approximately 75 percent occurs as snow from October to April. The geology of the watershed is complex and composed principally of sedimentary deposits. The reach being modeled (Figure 3) using HEC-RAS consists of alluvium and glacial outwash from the mountains to the south. The adjacent topography consists of less resistant bedrock comprised primarily of shale, mudstone, and siltstone. Land uses are quite varied throughout the watershed. High mountain areas are used for a variety of recreational and grazing purposes. There are several ski resorts and golf courses, as well as numerous agricultural land uses. Portions of the watershed are undergoing extensive growth from residential and commercial development. The agricultural uses are declining as the basin develops and becomes more urbanized. Figure 4. Silver Creek reach used for HEC-RAS modeling. Map shows individual cross-sections and USGS stage plate. Detailed maps showing individual reach sections can be found at the end. Figure 5 - Distribution of GPS Survey points for HEC-RAS modeling (in blue) shown over aerial photo. The USGS has run a gaging station at Silver Creek near Silver near Silver Creek Junction (#10129900) since October 2001 (Figure 6). The gage is at an elevation of 6,470 feet and is 1.2 miles east of Silver Creek Junction and 7 miles northeast of Park City with a drainage area of 17.4 square miles (Figure 3). Figure 6. USGS gaging station #10129900, looking downstream. Photograph taken on 7/28/2010, discharge 2.4 cfs. The maximum discharge for the period of record was 80 cfs recorded on March 29st, 2006, with a gage height of 6.76 ft. The daily-mean discharge for the period of record is 4.99 cfs (see Figures 7-10). In the summer months, much of the Silver Creek runs dry due to diversions like the Pace-Homer and as such much of the flow at the gage site come from the Water Treatment Plant to the west and south of the gaging site. The 2-year recurrence flood for the recorded period is 60 cfs. Figure 7. Daily mean discharge for period of record October 2001 to present. Figure 8. Daily mean discharge per year for period of record October 2001 to present. Figure 9. 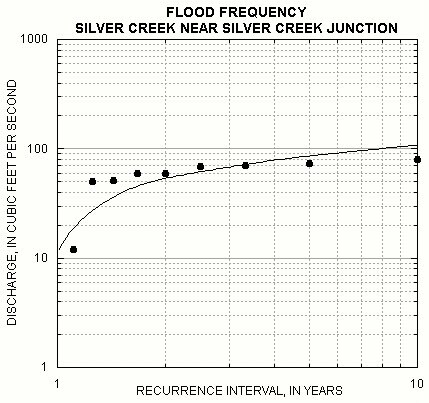 Flood frequency curve for Silver Creek near Silver Creek Junction. The rating relation for this gage is shown in Figure 10. The current rating relation is Rating 10. Comparison of rating 1 and 6 shows different shifts for discharges below and above 16 ft3/s. Below 16 ft3/s, the same flow occurs at lower stage than in 2001-2002. Above 16 ft3/s, the same flow occurs at higher stage than before. Figure 10. 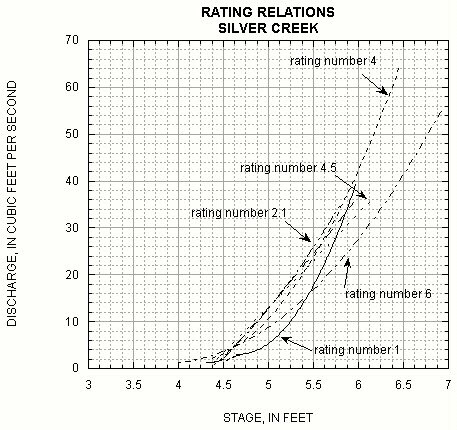 Stage Discharge Relationship for Silver Creek near Silver Creek Junction. Figure 11. Grains Size Distributions at Silver Creek. The survey data can be found here. Figure 12. Longitudinal Profile of HEC-RAS reach. Figure 13. Top of Reach (section numbers). Baker, M. 2004. Silver Creek TMDL for Dissolved Zinc and Cadmium, Utah Division of Water Quality TMDL Section 2004. Gill, H., Lund, W. 1984. Engineering Geology of Park City, Summit County, Utah, Utah Geological and Mineral Survey, Utah Department of Natural Resources, Special Studies, Salt Lake City, Utah. Briant, K., Johnson, K., Runkel, R. L., Steiger, J. 2003. Quantification of Metal Loading to Silver Creek Through the Silver Maple Claims Area, Park City, Utah, May 2002, USGS Water-Resources Investigation Report 03-4296, Salt Lake City. Chow, V.T. 1964. Handbook of Applied Hydrology.